This book is simply superb. The attractive cover is the first thing that grabs your attention and then the absorbing plot keeps your interest when you open the pages. The story takes an interesting look at the early stages of forensic science and how a few brave souls, Professor Hatton and his assistant Roumande, fight the sceptics to keep developing new techniques that they know have a lot of potential. This is the second book about them and this time they are developing finger printing. It is fascinating. The story is set in London in 1858, amid growing unrest in a time of political turmoil. An Irish politician dies in suspicious circumstances and his body is taken to Prof Hatton for post-mortem examination. His conclusion is murder - and this is confirmed by the long, green, silk ribbon that he removes from the victim's mouth. Other violent deaths soon take place, along with the disappearance of a famous French pastry chef, and they all seem to be connected but Hatton is not sure exactly how. Unbeknown to him, some would-be terrorists are also planning a potentially catastrophic bombing campaign in London. The pressure is on to discover the link between everything and catch the perpetrators before more lives are lost. Hatton is tested to the limits of his ability and the identity of the killer shocks him, as well as you, to the core. Although the characters are fictional, the story is set within some accurate historical horror and the truth of what happened during the Irish Potato Famine was an eye-opener for me. The way the peasants were driven from the land by their overlords, and sent to America crammed into ships that were full of cholera, is dreadful and just as shocking as the identity of the murderer in this tale. 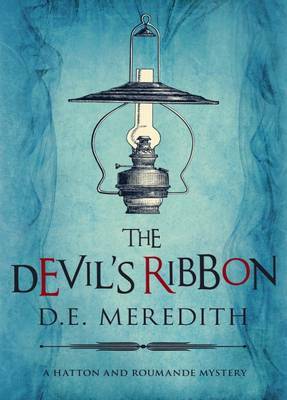 THE DEVIL'S RIBBON is a beautifully crafted, well-written and completely absorbing book. If you are a lover of historical crime fiction but also enjoy forensic science, and like a good twist at the end of your story, then you are going to absolutely love this book! Read another review of The Devil's Ribbon.